Plug your ears, lifers. Actually, on second thought, you Chicagoans need to hear this more than anyone: There’s barbecue in this town that would get a man exiled from his family if he served it in Memphis, Kansas City or Austin. Yet for some reason, many of you continue to support places that bake ribs, overcook brisket and turn pork shoulder to mush. I used to think it wasn’t your fault, that you just didn’t have a yardstick to measure by, but there are, in fact, a couple of good barbecue joints in Chicago (even if you can count them on one hand). Unfortunately, Brand BBQ won’t get us to that second hand. From top to bottom, across the board, the barbecue is just not good. 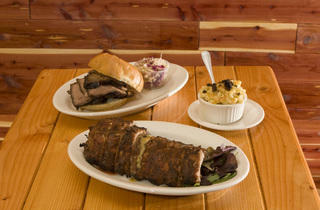 A sampler platter that holds a couple bites of the menu’s seven options goes 0 for seven—everything from the pulled pork to the brisket is underseasoned and overcooked, forcing the diner to drain the seven sauces alongside for flavor (and, in the process, obliterating the fundamental barbecue belief that good ’cue doesn’t need sauce). Even vegetarians don’t get a break—portobello caps are charred black but cold in the center, while tofu doesn’t get even a whisper of salt. 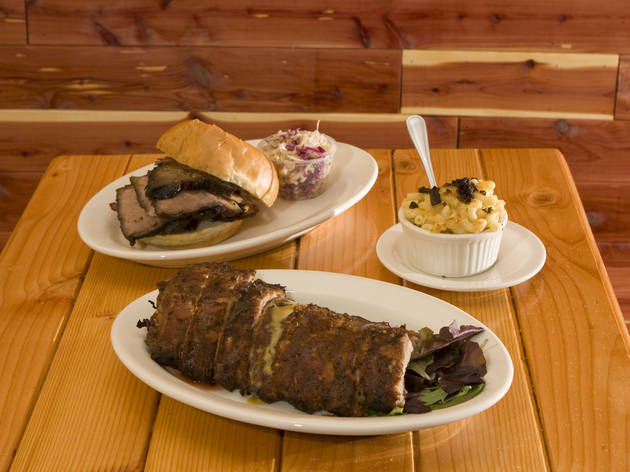 The menu promises that there is some smoking going on in the kitchen, but clearly the method doesn’t involve an actual wood-fired smoker or else the cooks are soft with the stuff, because there wasn’t a pink smoke ring to be found on the ribs or brisket. The most interesting thing on the menu is the appearance of burnt ends, the crunchy, smoky bits that fall off the tips of a brisket when you slice it. Burnt ends are a Kansas City “invention,” and seeing them outside of that part of the country is like spotting a unicorn. At Brand, the little guys are thrown on top of a decent mac and cheese and mixed into ground beef for a burger that turns out to be the highlight of two meals. The burnt ends are crispy, flavorful and seasoned well, but when a burger is the best thing at a barbecue joint, it’s time for a new pitmaster. El stop: Blue to California. Bus: 52, 56, 73.